For people named Billingham, see Billingham (surname). 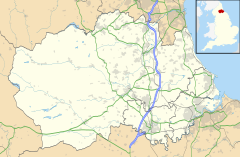 Billingham is a town in County Durham, England, with a population of 35,165 according to the 2011 Census. It was founded circa 650 by a group of Angles known as Billa's people, which is where the name Billingham is thought to have originated. In modern history, the chemical industry, and in particular the company ICI, has played an important role in the growth of Billingham. The town is administered as part of the Borough of Stockton-on-Tees. Today ICI no longer operates in Billingham, although other chemical companies are working in the area. Following the fragmentation and ultimate loss of the chemicals conglomerate, ICI, the Billingham Chemical Industrial park became a multi-company facility. The chemical, biotechnology and engineering companies that continue to operate at Billingham are members of the Northeast of England Process Industry Cluster (NEPIC). They include GrowHow, Johnson Matthey, FujiFilm Diosynth Biologics and Fruitarom. Other members of the NEPIC Cluster operate from the 62 acre Belasis Business Park in Billingham such as Cambridge Research Biochemicals, ABB Group and Biochemica. Growhow not only manufacture fertilisers & industrial chemicals in Bilingham they also capture the CO2 for use in the food & drink industry. Tomatoes are grown in Billingham by North Bank Growers using the recoverable energy from the Billingham complex, which further reduces the area's carbon footprint. A clue to Billingham's early origins is seen in the prominent Anglo-Saxon tower of St Cuthbert's Parish Church. The tower was built c. AD 1000, but elements of a late-7th/early-8th-century Nave also remain, and there is a 7th-century grave-marker from the church in the British Museum. With the declaration of the First World War, a high demand for explosives led to a massive expansion of Billingham. In 1917, Billingham was chosen to be the site of a new chemical works supplying ammonia for the war. However, the plant was completed in 1920, after the war had ended. The Brunner Mond Company took over the site, and converted it to manufacture fertilisers. In December 1926, Brunner Mond merged with three other chemical companies to form Imperial Chemical Industries (ICI), who took control of the plant. ICI began to produce plastics at Billingham in 1966. This is one of the most extraordinary of experiences, a sight almost unique in England. On either side of the road are the works. Steaming, sizzling—tall steel towers, great cylinders, pipes everywhere... At night the whole industrial world along the banks of the Tees comes to life... brilliant with a thousand lights, the great girders of the Transporter Bridge dark in silhouette: a magic city. From 1971 to 1988 ICI operated a small General Atomics TRIGA Mark I nuclear reactor at its Billingham factory to produce radio-isotopes for use in process instrumentation such as level measurement devices. In addition to its own on-site coal-fired power station, ICI also operated the coal-fired North Tees Power Station, designed by Giles Gilbert Scott, on the banks of the Tees to provide electricity for its plants. The latter was eventually decommissioned and demolished (at a ceremony attended by Environment Secretary Nicholas Ridley) in 1987. The site of the power station is now Billingham Reach Industrial Estate, an international wharf owned by Able UK Ltd. ICI no longer operates in Billingham, having sold many of its businesses during the restructuring of the company in the 1990s. Some of the company's former manufacturing plants are still in operation, run by other chemical companies. In 1983, NIREX announced a proposal to use the now-disused anhydrite mine as a site for the disposal of intermediate level nuclear waste. There was a huge public outcry led by BAND (Billingham Against Nuclear Dumping) Chairman Reverend Peter Hirst, since despite the suitability of the site in geological terms, it was very close to a large population centre. Subsequently, in 1985, the plans were dropped. More recent plans in 2007 to re-open the mines for "use as a long-term disposal facility for low hazard waste" were met with similar opposition, and a petition of 3,200 signatures against the mine's opening was presented to the local authority. In March 2011 Stockton Council's planning committee accepted an application from NPL Waste Management to reopen the mine for the disposal of hazardous waste. NPL planned to convert the mine into a 4,000,000 cubic metre waste storage facility, receiving over 100,000 tonnes of waste annually. Between 1923 and 1968, Billingham had its own urban district council which built, among other things, the Billingham Forum, Kennedy Gardens and Billingham Golf Club (the UK's first municipally-owned club). It was absorbed into the County Borough of Teesside in 1968. In 1974 Teesside County Borugh Council was abolished being replaced by the County of Cleveland which had four districts, Hartlepool, Langbaurgh-on-Tees, Middlesbrough and Stockton on Tees. Billingham was then part of Stockton on Tees. In 1996 Cleveland County Council was abolished with Billingham being part of a new unitary (single tier) council for all of Stockton and Billingham. In February 2007, the Department for Communities and Local Government and the Electoral Commission issued orders for the creation of a Billingham Parish and the setting up of a new town council. Billingham Town Council is the largest in the Borough of Stockton. It is funded by a precept of £80,000. Elections for the new Town Council were held on 3 May 2007, a petition to Stockton Borough Council and referendum held in 2003 having both given assent to the proposal. Several chemical plants close to the town were subject to explosions and leaks in 2006 and 2007. Billingham has an oceanic climate (Cfb). The town is fairly warm in the summer and the temperature can rise above 30 °C (86 °F) but this is rare, in the winter temperatures can drop below 0 °C (32 °F) but this is also rare. The town is effectively split into two separate areas by name, Old Billingham (the area around the village green adjacent to St Cuthbert's church and built up around the ICI works) and the more planned estates that have spread out since the 1950s, increasing the town's size and borders towards the villages of Wolviston and Cowpen Bewley, to the point of almost incorporating them. Billingham Beck Valley Country Park was constructed from a reclaimed industrial waste tip and has steadily grown to include former grazing land to form a 120-acre (0.49 km2) site including wetland habitats. Designated as a Local Nature Reserve by English Nature in 1992, in 2005 it won a Green Flag Award. The beck itself is one of the major tributaries of the River Tees and has a tidal reach around the former ICI site. The population of Billingham, according to the census of 1801, was 962. This number increased slowly until the beginnings of World War One, in which the need for nitrates, to use in explosives, brought about a significant burst of growth for the town. In 1917, Billingham was chosen as the site for the production of Synthetic Ammonia due to its good transport links and access to the resources needed and the population of the town nearly doubled in just a few years from 4500 to 8000. After the war, the site was bought by Brunner Mond and converted for use in the production of agricultural fertiliser, who soon merged with a number of other companies to form Imperial Chemical Industries. This continued the population expansion of Billingham, reaching nearly 18,000 by 1931. With the onset of World War Two, synthetic ammonia for explosives was once again in demand, further continuing the town's development. During the latter half of the 20th century, the population of Billingham slowed significantly due to the industrial decline of the area. Population data for 1801–1971 is available at Britain Through Time. Billingham is served by two secondary schools: Northfield School, a specialist sports college famous for Jamie Bell and Paul Smith from the band Maximo Park and St Michael's Catholic Academy, a specialist Science Catholic academy. Northfield Marsh House site, formerly Campus, was closed in 2012. At the moment construction is ongoing for St. Michael's to join the Billingham Campus and New Bede/Riverside College facilities on the Marsh House Avenue site, in a project The Council has published plans for a £40 million investment in Primary Schools which will include some being rebuilt or re-designed and refurbished. Roseberry Primary School and Bewley Infant and Bewley Junior Schools are on the list for action within the next few years. Bede College has served the town for several years, and attracts students from Hartlepool and Stockton, consistently achieving higher results than nearby colleges in Stockton or Middlesbrough. It was one of the smallest colleges in the UK, with under 400 students, however its recent amalgamation with Stockton Riverside College and its relocation to an adjacent new campus, has seen these numbers increase significantly; as part of the new campus the college has gained its own sports facilities. Billingham is home to several religious communities, the largest of which are the Church of England, and the Roman Catholic Church. The Church of England community is served by a single Team Parish, with five parish churches - St. Cuthbert's, St. Luke's, St. Mary Magdalene, St. Aidan's, and St. Peter's. The parish covers all of Billingham, the Clarences, Cowpen Bewley, Newton Bewley and Wolviston. It is part of the Church of England Deanery of Stockton, in the Archdeaconry of Auckland, which itself is within the Diocese of Durham. The Roman Catholic community is served by three parishes, Our Lady of the Most Holy Rosary Parish Billingham, St. John the Evangelist and St. Joseph's. Regular mass attendance in the town is around 756, according to figures released by the Diocese of Hexham and Newcastle[citation needed]. The parish is placed in the episcopal area of Cleveland and South Durham and the deanery of St. Peter, including Stockton and Billingham. There is also St Michaels RC Secondary School in Billingham with just under 1000 students. The Christian community is also served by two Methodist churches, one Baptist church and a Pentecostal Church called "New Life" based on Low Grange Avenue. There is also a Church Of Jesus Christ Of Latter-Day Saints, and a Kingdom Hall of Jehovah's Witnesses. Billingham Town Centre provides the town with famous national retail chains such as Asda, Greggs, Iceland Argos, Aldi, Costa, Poundland, as well as several charity shops, estate agents and banks, with a market featuring in the centre every Monday and Friday. The town centre lacks some services, but Stockton Town Centre is less than 3 miles (4.8 km) away and Middlesbrough Town Centre is also less than 3 miles (4.8 km) away. In 1967, Associated Dairies fledgling stores division which it had launched in 1965 opened their first store outside of its Yorkshire heartland in the town centre. Asda Billingham was their first store to open in the North East and is now the oldest continuously trading Asda supermarket in the UK. In March 2012, it was confirmed that a Wetherspoons Public House would be opened in the Town Centre, along with a Fulton Frozen Foods superstore, as part of the ongoing regeneration plans. In August each year the town centre hosts the Billingham International Folklore Festival - now in its 54th year (2018). Dancers and musicians perform traditional and contemporary dance. In November 2013, a time capsule was buried in front of 'The Family' statue in Billingham Town centre under a stone with the inscription 'FOREVER FORWARD 30 11 2013'. The capsule is not to be unearthed until the year 2078. The chemical industry's creation of ammonia in the town also led to the formation of one of Billingham's two football teams, Billingham Synthonia, Synthonia being a portmanteau of Synthetic Ammonia, and of similar origins is Billingham Synthonia Cricket Club. Billingham also is the home of Billingham Town F.C., who celebrated their 50th anniversary in 2017 having been initially founded in 1967 as Billingham Social Club F.C. At the beginning of the 2017-18 season, Billingham Synthonia F.C. relocated to the Norton Sports Complex, former home to Norton & Stockton Ancients F.C. due to financial difficulties. The town also has its own ice hockey team (the Billingham Stars) in the English National Ice Hockey League, whose home rink is Billingham Forum Ice Arena. There is also an other ice hockey team called the Billingham wildcats which is made up of women aged 16+. The town has one Rugby Union Club Billingham Rugby Union Football Club which has four senior teams, the 1st XV currently playing in National 3 North, four leagues from the Premiership. The 2nd XV (Lions) currently playing in The "Candy League" Division 1. The 3rd XV currently playing in The "Teesside Merit League". The Colts playing a competitive Saturday Colts League. The club has a junior section ranging from u7 minis to u16's with teams winning Durham county cups and leagues. Billingham Forum, housing a theatre and sports facilities as it appeared before the 2009 renovations. In 1967, Billingham Forum was opened by Queen Elizabeth II. A sports and leisure complex, it contains a swimming pool, an ice rink, and a number of sports halls. The complex also houses the Forum Theatre. Notable personalities that have performed in the theatre include the late EastEnders icon Wendy Richard, Jimmy Edwards, Eric Sykes, Darren Day, Arthur Lowe, David Jason, Penelope Keith, Terry Scott, Timothy West, Carroll Baker, and Dame Anna Neagle. Roy Chubby Brown performed there for the first time in November 2006; his DVD for 2007 was recorded there as well. As part of the proposals to regenerate Billingham, a 'Gateway' initiative proposed the construction of a new sports and leisure centre on John Whitehead Park to replace the Forum. This proved highly controversial, particularly as the Forum's would-be-replacement did not contain a theatre. The proposals were abandoned in November 2004, shortly after the Forum Theatre was granted Grade II listed building status. Following a survey that reported 98% of participants in favour, Stockton Borough Council now intend to submit a bid of £15 - 20 million to refurbish the Forum Complex in partnership with The Billingham Partnership group. On 2 June 2011, the Billingham Forum returned from its £15m refurbishment, which started in mid-2009. The Billingham Forum now encompasses a theatre, business standard conferencing facilities, a swimming facility, a large Ice Arena, a state-of-the-art Activ8 Gym with TechnoGym Digital exercising equipment, a sauna and steam room, fun indoor climbing (GoClimb), a sports injury centre, and dry sports and drama facilities. There was originally a fish pond in the centre of Billingham Forum, however this has been removed. The exterior wall panels have also been replenished with a colour scheme of Dark Blue, Grey and Yellow. Billingham Forum is owned by Stockton Borough Council and is managed by Tees Active Ltd.
Andrew Davies, former Middlesbrough F.C., Southampton F.C., Stoke City F.C. footballer currently with Bradford City A.F.C. ^ "Town population 2011". Retrieved 23 July 2015. ^ "Teesside fertiliser plant praised for more production yet decreasing discharges". Environment Times. 27 October 2009. ^ "Hazardous waste set to be dumped in Teesside mine". Evening Gazette. Middlesbrough. 3 March 2011. p. 4. ^ "Explosions rock chemical factory". BBC News. 1 June 2006. ^ "Dozens injured in chemical leak". BBC News. 4 January 2007. For further information about the above parishes, see List of civil parishes in County Durham. For the part of Stockton-on-Tees (borough) south of the River Tees, see List of civil parishes in North Yorkshire.